The filing was announced by Gregory D. Helmer, of the Los Angeles law firm of Helmer Friedman, LLP, who represents the two coaches. Daniel Calichman and Theothoros Chronopoulos, both of whom were former professional soccer players and members of the U.S.National Team before being hired by Chivas USA, are suing in Los Angeles Superior Court. The men, described in the complaint as “Caucasian, non-Latino Americans,” allege discrimination, harassment, retaliation and wrongful termination by Chivas USA based on national origin, ethnicity and race. Mr. Chronopoulos and Mr. Calichman were employed as coaches in the Chivas USA Academy, which offers soccer programs for youngsters from approximately age seven through age 18. Mr. Helmer noted that the Chivas USA team was formed in 2004 by a group that included Jorge Vergara Madrigal, a prominent Mexican businessman. Two years earlier Mr. Vergara had acquired Chivas de Guadalajara. The Mexican team, popularly known as “Chivas,” has since 1908 had a stated policy of hiring only players who are Mexican-born or born of Mexican parents. In 2012, Mr. Vergara acquired full ownership of Chivas USA and, according to the complaint, began to “implement a discriminatory policy similar to the ethnocentric ‘Mexican-only’ policy that exists at Chivas de Guadalajara.” This included “replacing players and staff who had no Mexican or Latino heritage,” and appointing Mexican nationals to the team’s top executive positions. In late November of 2012, the complaint states, Jose David, the team’s newly hired president and chief business officer, asked Mr. Chronopoulos to report which Academy players and coaches were Mexican or Mexican-American and which were not. On January 11, 2013, Mr. Calichman and Mr. Chronopoulos submitted written complaints of discrimination and harassment to the team’s Human Resources Manager, Cynthia Craig. At a meeting three days later, according to the court filing, “Ms. Craig assured Mr. Calichman that Chivas USA was going to conduct a ‘full investigation’” into the men’s complaint, but no investigation was made. The following day, the complaint states, Ms. Craig contacted both men proposing that they resign from their jobs in exchange for two weeks of severance. On January 18, Mr. Calichman responded by email, rejecting the proposal and asking Ms. Craig to verify that he was still employed. In February, having received no response to their allegations of harassment and discrimination, the court filing states, the men filed complaints with the California Department of Fair Employment and Housing. On March 7, 2013, according to the court filing, both men received identical letters from Mr. David, notifying them that their employment was being terminated as of the following day. Their lawsuit notes that “the letter is conspicuously silent” as to whether the company had investigated their complaints of harassment and discrimination. “Moreover, in further retaliation for their complaints, Mr. David falsely and maliciously accused them of ‘demonstrat[ing] unprofessional conduct that created an unsafe work environment,’” without stating how they allegedly did so. The lawsuit seeks general, special and punitive damages in amounts to be determined at trial, as well as any other relief the Court may deem proper. Also named as defendants are Insperity, Inc. and Insperity Business Services, L.P. The complaint alleges that Insperity is a joint employer with Chivas USA and, in that capacity, is liable for any unlawful employment practices. 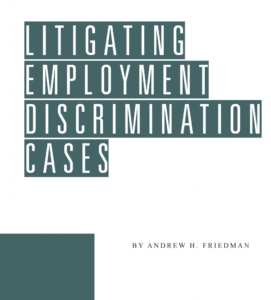 Helmer Friedman LLP provides legal representation and advice in a wide range of areas, including labor and employment, sports, and entertainment. The firm can be reached at 310-396-7714 or www.helmerfriedman.com.